Response card: Matching %100 cotton Crane Lettra cardstock and matching envelope. You print and cut from letter-sized sheets, or we print and deliver finished size. 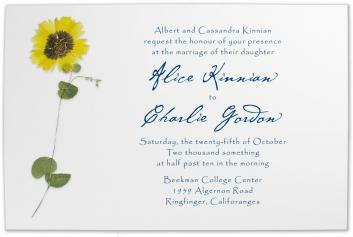 Any leaves of petals from the flowers or stems can be glued to the rsvp card as a sweet accent. DIY printable Crane cotton cardstock. The invitation and envelope are made in the US. Real pressed flower and separate stems and leaves. (Flexible flower - holds up very well!) This design works very well with modern wedding graphics, offering a very large canvas measuring 7 3/4 inches by 5 1/2 inches wide. (A8 size) ECO PAPER FACTS: 100% cotton cards, envelopes are 100% recycled, with 50% PCW. Very handsome. Treefree, other than the envelope. Large pressed yellow flower and separate sprigs of stems and leaves. Colors: Softwhite, yellow, brown and spring green. Wet glue/brush: For gluing flowers and stems. We include a fine calligraphy brush for dotting glue on the flower and stems.